Tuesday 8:30 a.m. – 7:30 p.m.
Thursday 8:30 a.m. – 7:30 p.m.
Friday 8:30 a.m. – 7:30 p.m.
Saturday 8:30 a.m. – 2:30 p.m. When you call us, you will receive courteous attention from our caring staff. We will get as much information as possible over the phone to assist you in scheduling a prompt and convenient appointment. If you cannot keep an appointment, please give us at least a 24 hours notice. This time is needed to reschedule other patients and to avoid charges for missed appointments. On your first visit, please arrive at least 15 minutes early so we can gather your complete medical history, current medication, allergies and insurance coverage. The more we know about your health, the better we can care for you. Your health and welfare are important to us. We strictly comply with all recommended infection control procedures. We also follow rigorous cleaning, disinfecting, and sterilizing procedures of all instruments. We ask you to pay your bill when you visit us. We accept cash, checks, VISA and MasterCard. Because insurance benefits vary, it’s important that you know and understand your coverage. We’ll complete and file the necessary papers for you. Your carrier may pay all or some of your bill, but remember, we ask you to pay at the time of service for any balances your insurance won’t cover. We will give you an estimated fee for treatment needed before we start. We base our fees on knowledge, clinical experience, material used, and staff skills. You’ll find an excellent value for the highest quality of dental care you receive. There is no greater compliment than having you ask us to care for your friends or family members. We appreciate your vote of confidence and pledge to care for these VIPs as well as well as we care for you. If your family doctor has referred you to our practice, we’ll stay in touch with your physician during your treatment. We always strive to work as a team to provide you with the best care possible. Diane M., New York City : What a phenomenal dental specialist you are! Since I have been under your care, my teeth and gums look and feel healthy. They are healing nicely! Many thanks, Dr. Iskaros! 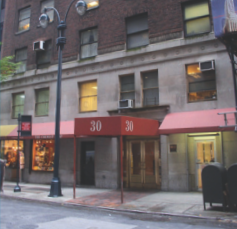 Our office is conveniently located on 40th Street between Park & Madison. Come in or call today! For appointments and to schedule your first consultation, call our friendly staff at (212) 557-7711. Make sure to check our current promotions for great savings on a wide range of professional services!